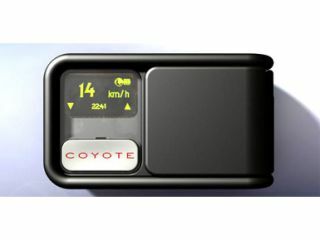 A new device from Novus, called the Mini-Coyote, will help other drivers to find out where the police are hiding with a speed gun as it lets you press a button to update a database of mobile cameras. The dashboard device works by 'linking' drivers together through the centralised GPS-based database, so if you're around 300 yards behind a driver that presses the button you'll get the update quick enough to slow down before the camera. However, there is a chance you could get in trouble with the police in another way for using the Mini-Coyote, as it technically is 'perverting the course of justice' by allowing drivers to avoid the hidden cameras, according to The Times. However, the AA has stated it's extremely unlikely any such prosecution would stick, although the Government has announced it intends to outlaw devices that detect radar or laser systems used by speed cameras. The device has already gained more than 50,000 users in France, where they alerted one another to 27,000 new traps in just one month. So pick up a Mini-Coyote if you hate speed cameras and like the thought of being part of the resistance.